Liverpool were ready, they said, to lavish £61m (€70m) on the Napoli forward, but didn’t want to approach the Partenopei’s chairman, Aurelio De Laurentiis, in case he shouted at them. Raiola clearly felt the same way, because apparently he spoke in turn to the player’s father Carmine, but eventually word finally filtered down to De Laurentiis. He, according to La Repubblica, replied that the 27-year-old was worth considerably more than that, but he might accept a bid of €150m. This has not, the paper warns, put anyone off, and further discussions are expected, with the player’s decision to join Raiola’s stable late last year seen as something of a come-and-negotiate-me-a-massive-transfer plea. How Unai Emery must wish for some of that spending power, with his summer Arsenal-rebuilding war chest amounting to just £40m, according to the Mirror. With the deal already in place to make Denis Suárez’s loan move permanent set to eat up almost half of that, a meagre £22m will be left over to reshape the team’s struggling defence, enough for 29% of a Virgil van Dijk. The Sun adds that this sum could be boosted to £60m if he manages to qualify for the Champions League, with which he would like, they say, five players - “two wingers, a couple of full-backs and at least one centre-back”. The Mail, slightly more encouragingly, says he will have £45m and only wants “at least three players including a left-back”. One defensive recruit they may be keen on is the Leipzig centre-back Ibrahima Konaté, with whom they have been linked in the German media. Bayern Munich will resume their Callum Hudson-Odoi chase in the summer, with their chairman, Karl-Heinz Rummenigge, saying that their sporting director Hasan Salihamidzic had “practically fallen in love with this player on account of his quality. Hasan will work to make it happen on the second try. We want to have the best quality of players at Bayern and Hasan is totally convinced of this player.” Meanwhile Chelsea’s Reece James has done well enough on loan at Wigan to get Brighton and Crystal Palace excited. The door is starting to creak open for Manchester City. Liverpool, with the weight of history threatening to pin them down, found their title charge losing further momentum on an evening of suffocating tension. Even the gift of an offside goal was not enough to extinguish the nerves choking the Premier League’s pacesetters, heightening the impression that Jurgen Klopp’s red machine is finally showing signs of wear and tear. This was the second successive game Liverpool were gripped by stage fright, with their anxiety captured by the moment when Divock Origi fluffed a glorious opportunity to steal the points with the final kick of a fraught contest. Time stood still when Naby Keïta’s lofted pass fooled West Ham’s stubborn back four and the stage seemed set for Origi, on as a late substitute, to repeat the stoppage-time heroics that won the Merseyside derby two months ago. The striker’s weak effort went straight at Lukasz Fabianski and means Liverpool’s lead over City stands at three points, presenting the champions with an opportunity to go top when they visit Everton on Wednesday night. City can smell blood in the water. Once again Liverpool failed to master mid-table opposition, following up last week’s home draw against Leicester with another laboured display, and they were fortunate to leave east London with a point. West Ham, bright and inventive in possession, were entitled to feel that they deserved to win. It spoke volumes that Manuel Pellegrini expressed disappointment at the draw. 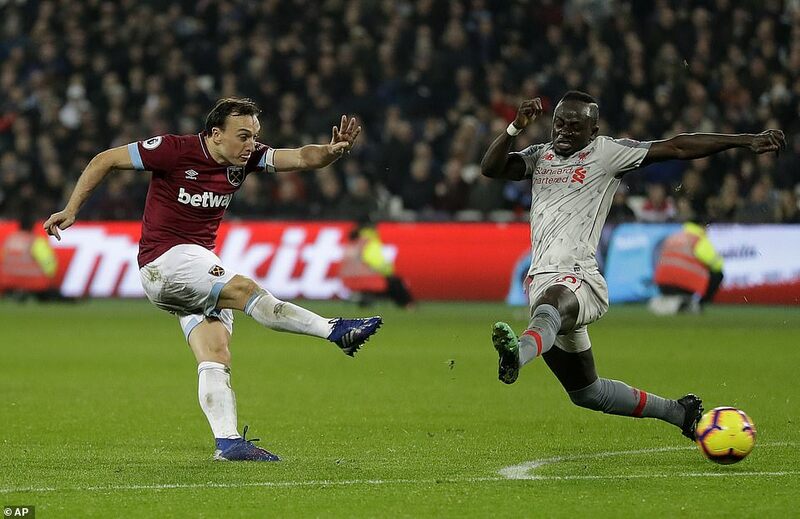 West Ham defended with impressive organisation, made the clearer chances and were aggrieved with the officials for failing to spot that James Milner was at least a yard offside during the move that culminated in Sadio Mané putting Liverpool in front midway through the first half. Evidence of City’s silky swagger returning during their win over Arsenal on Sunday had raised the stakes before Liverpool’s latest assignment and there were hints that the visitors were feeling the pressure during a difficult opening period. 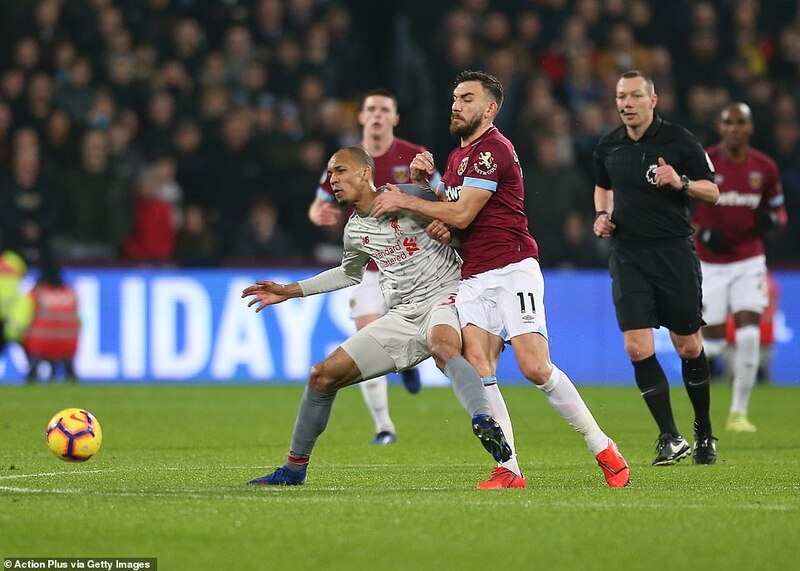 West Ham flew forward from the first whistle, with Felipe Anderson eager to test out Milner’s nous at right-back, and the hosts looked more than capable of coping without the injured Marko Arnautovic leading their attack. Although West Ham are drifting in mid-table and out of the FA Cup after a dismal defeat by AFC Wimbledon, they played with the handbrake off. Javier Hernández stung Alisson from long range and the little Mexican ought to have scored after twisting past Virgil van Dijk in the third minute, only to bend his shot inches wide. After a while Liverpool found some poise, remembering perhaps that they had scored 16 goals in their previous four meetings with West Ham. Making his fourth league start of the season, Adam Lallana created the danger with a lovely pass into space down the right. West Ham appealed in vain for a flag as the ball reached Milner. He crossed for Mané, who spun Issa Diop and fired past Fabianski. How the travelling fans roared, sensing lift-off. 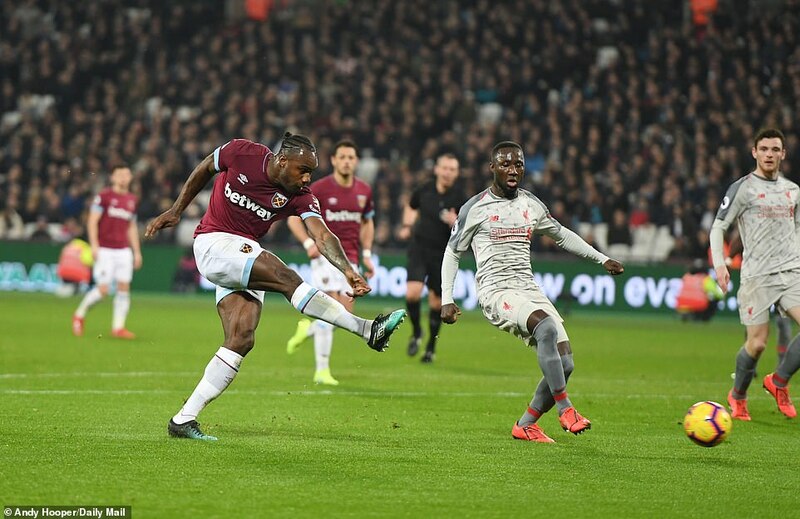 Yet there have been signs of vulnerability from Liverpool’s defence in recent weeks and West Ham reeled them in with a clever free-kick routine in the 28th minute. 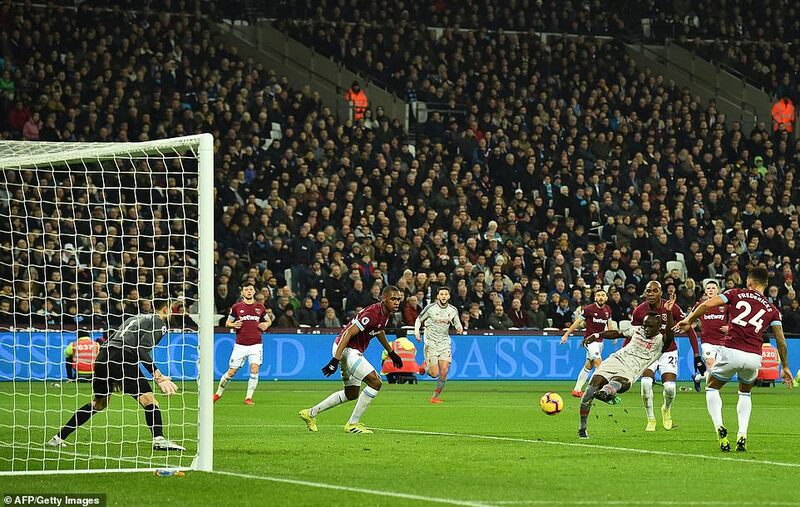 With their opponents waiting for a cross, Anderson and Robert Snodgrass combined to release Michail Antonio, who held off Keïta before leaving Alisson rooted to the spot with a firm shot. 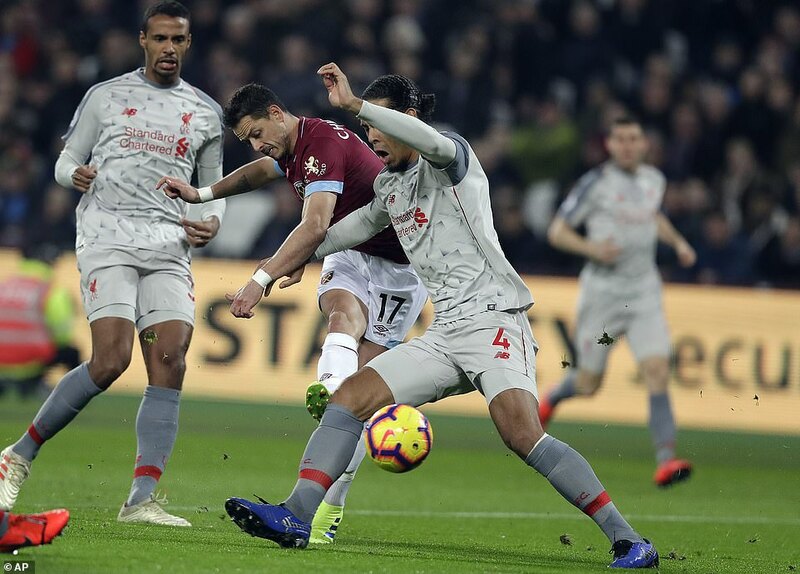 Liverpool suffered without the leadership of Jordan Henderson and energy of Georginio Wijnaldum in midfield, where Keïta struggled to assert himself against Declan Rice and Mark Noble, and West Ham should have led at the break. Another free-kick from Anderson deserved a sharper finish from Rice, who was aghast to put his free header over. These are the occasions when elite players prove their class. The contest had become a test of Liverpool’s mettle and they needed more from Mohamed Salah in the second half, but the Egyptian found it tough to shake off Cresswell, West Ham’s diligent left-back. Instead it was Anderson who was threatening, always demanding the ball, always willing to run at defenders, luring Joël Matip into a clumsy foul with a piece of skill that left the centre-back looking dizzy. Liverpool started to rush their passes. Team-mates glared at each other after snatched decisions in the final third. With the minutes ticking away and emotions rising, hope flared when Salah wriggled through on the right and made to shape one of those trademark curling shots into the far corner, but it was too close to Fabianski. It was beginning to feel like one of those nights. Klopp argued that injuries have disrupted Liverpool’s rhythm, pointing out that Milner had missed four days of training with a virus. Van Dijk also looked leggy in central defence and Trent Alexander-Arnold’s return from a knee injury cannot come soon enough. Liverpool need the right-back’s youthful enterprise and quality deliveries. They had run out of ideas long before the end. West Ham protected Fabianski’s goal with impressive organisation, with Rice so perceptive in his screening role, and they went closest to forcing a second goal, Noble’s volley flying narrowly over. When it was over Klopp held an agitated conversation with Pellegrini on the touchline. There was no doubt which manager was feeling more relaxed about life. This is what pressure does. Grey men, literally and metaphorically. The momentum is leaking from Liverpool as tension takes hold. West Ham have been their bunnies of late, conceding four goals in each of their previous four meetings. Last night, they left the field feeling they should have won — and with some justification. They missed the best chances of the match — plural — and Liverpool’s goal contained a clear offside in the build-up. The final exchanges were uncomfortable as the league leaders went in search of victory, and the last play of the match found Divock Origi with only the goalkeeper to beat — he was offside, but there was no flag, as is the fashion it seems. But who wasn’t expecting Liverpool to throw the kitchen sink at it in search of three points? In the end, it wasn’t the sink, more of a hand basin. The insipid grey change strip rather summed up Liverpool’s performance. West Ham didn’t get a shot on target after half-time but, even then, probably had the best chance of the late exchanges when Mark Noble shot over from close range on 73 minutes. So, yes, there was a final flurry from Liverpool — and they could have snatched it against the balance of play in injury time had Origi not shot tamely at Lukasz Fabianski — but what preceded it must concern Jurgen Klopp. The mounting total of misplaced passes, the vulnerability from set-pieces, the general lethargy. This is not the Liverpool we know, the team of the season so far. If Manchester City win at Everton tomorrow night they will go top on goal difference, albeit having played a game more. Nonetheless, there is the potential for momentum shift. A week ago, after City lost at Newcastle, some thought they had blown it. Now their challenge seems more alive than ever as the strain of being front-runners — and a lengthy list of injuries in defensive positions — take a toll on Liverpool. There were moments in the second half when Mo Salah looked capable of sparking something, including one fabulous piece of trickery that removed two West Ham players from the game. But this was one of his quieter evenings. The same for Roberto Firmino, who was withdrawn early. West Ham, meanwhile were without Marko Arnautovic, but still created the majority of chances. And this is how it is going to be, from here. Liverpool and Manchester City trading blows, gaining and losing advantage, needing to match their results each week, from now until May. There are no jokers to play either — no six-point head-to-head meetings. They have all gone. Tottenham are in it, too, so this is a proper scrap, a better title race than we have witnessed since the days when Brendan Rodgers was Liverpool manager, and ended up ceding the spoils to Manchester City at the last. Liverpool benefited hugely from by far the biggest officiating error of the night. There have often been complaints about the sight lines at the London Stadium but how they prevented linesman Simon Beck spotting an offside in the build-up to Liverpool’s goal that happened almost within touching distance is a mystery. That flagging for it would have cancelled out a wonderful piece of skill from Adam Lallana is irrelevant. Credit Lallana, though, and James Milner too. It was Milner’s 81st assist of his Premier League career, putting him in the top seven goal providers, and overtaking David Beckham’s 80. At first it looked as if Lallana had merely battled his way through two West Ham defenders. Closer inspection, however, revealed quite lovely footwork, shifting the ball one way then another before lifting it artfully to Milner on the overlap. He was offside, though, and by some distance, too. And Beck was right there, almost a participant. No flag, though, and Milner capitalised by whipping in a cross to Sadio Mane. And while West Ham can feel aggrieved about that build-up, that is no excuse for the room the scorer was allowed. Mane had space to turn and fire a low shot past Fabianski. It had taken a little time but it seemed as if at last Liverpool were away. As has been the case at the top of late, though, it didn’t quite unfold as planned. Within six minutes, West Ham restored deserved parity through a brilliantly worked free-kick. Aaron Cresswell rolled the ball to Felipe Anderson, who stopped it and slipped a pass through to Michail Antonio, urgently in front of Naby Keita. His low shot went across Alisson with such precision the goalkeeper was caught flat-footed. He didn’t even move. It wasn’t the only time West Ham’s set-pieces troubled Liverpool. By the end of the half they could easily have taken advantage on two further occasions. The set-up was always the same — short, rolled to Anderson — but the delivery seemed to take Klopp’s men by surprise. 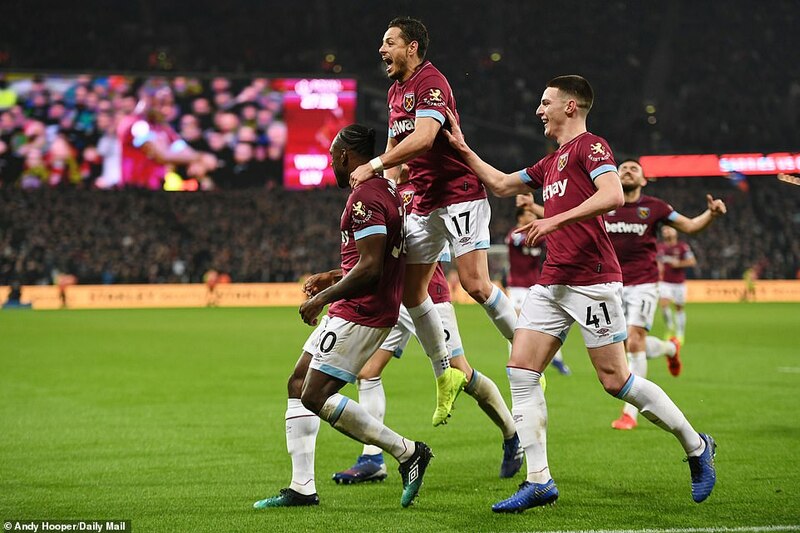 Next time out, the ball was struck deep to Javier Hernandez who sent a volleyed shot into orbit, where it was met by another volley, from Noble, landing on the roof of the net. Then, with four minutes to go before half-time, West Ham spurned the chance of the game. The same free-kick routine this time found Declan Rice streaking ahead of Liverpool’s defence, unmarked. It was him versus Alisson, and a free header. He missed the target. 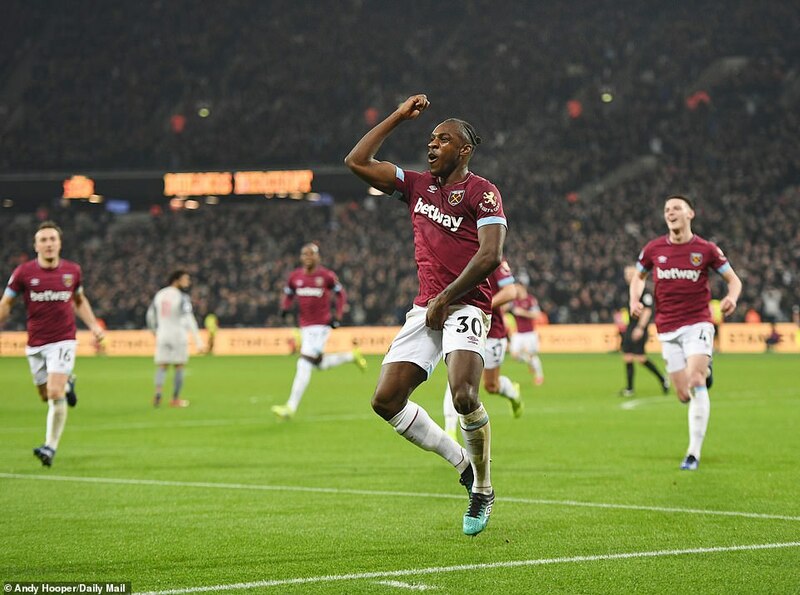 He’s a brilliant young talent and the star of West Ham’s season so, after the initial shock, he drew a sympathetic round of applause and encouragement. But what a chance it was. What a chance. And there were a few other moments. The game was only three minutes old when Noble picked out Hernandez, who cut inside but screwed his low shot wide of the far post. Just seven minutes later, Cresswell took a chance from 25 yards and missed narrowly — and from similar range in the 16th minute Hernandez forced an excellent save from Alisson. Liverpool were strangely subdued. There was little sign of recent supremacy. Even so, they remain three points clear. Everton is never an easy place to go, even with the team in poor form, so nothing is guaranteed for City. Yet last Wednesday morning, Liverpool needed to defeat Leicester at Anfield to move seven points clear, and now, when they return there to play Bournemouth on Saturday, they could be in second place. Maybe having the pressure off will suit them. It’s the one silver lining right now. Xande Silva – who was believed to have recovered from injury is still feeling problems from a hernia – and may need an operation. The never ending list of injuries continue to pile up and on a night when he could have expected to perhaps make his bow at some point, CandH was told the youngster had a problem. The 21 year old striker is one of the brightest of the academy products and should he require an operation he could be out for a month to six weeks following that. We were told after last night’s match by our senior source on e-mail: “We still have a lot of niggling injuries with Silva among them. The young Portuguese – who cost £1.8 million in the summer – has only relatively recently recovered from a hamstring injury. West Ham United have been credited with an interest in RB Leipzig defender Ibrahima Konate. Konate has been in impressive form for the Bundesliga outfit. This term has been his true breakthrough and he’s made 21 appearances across all competitions so far. He is already becoming an integral part of Leipzig’s defence, and it’s easy to understand the interest from other big clubs. West Ham could make another Issa Diop-style signing by winning the race for Konate. The talented teen, a French youth international just like Diop, appears to be quite similar to the West Ham man, who signed for the club last summer from Toulouse. Standing at 6ft 4in, Konate is very imposing and is a dominant force in the air – as evidenced by his average of 3.3 aerials duals won per game (via WhoScored), which is actually higher than Diop’s (2.3). He is a proactive defender who is fierce in the tackle, and a potential pairing of him and Diop could be frightening. Diop has enjoyed a fine start to his Irons career and has been Manuel Pellegrini’s number one centre-back this term. He appears to be tailor-made to the Premier League, meaning the similar Konate could also prove a hit. I got injured last night whilst watching the game bloody WHU curse. Jesus, even our reserve players are getting injured now! !